Beware this review contains spoilers. 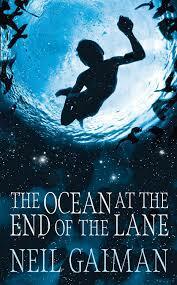 Not being one to follow the crowd I fell in love with Neil Gaiman’s The Ocean at the End of the Lane long before it was named 2013’s book of the year. In summary it is a short, poignant book that explores myth, memory and identity through the experiences of a seven-year old boy. These experiences are recalled by his adult self on returning to his childhood home and the area he grew up in. Like Coraline and The Graveyard Book, the novel has a young central character, a resourceful and determined child who is left to fend for them-self in a world transfigured by danger and terror. However it is unique in the fact that it is the first novel by Neil Gaiman to include details from his own life. The plot is typical of an underworld journey. The man returns to the farm he visited as a seven-year old child, recalls his supernatural adventures, then leaves again to go back to his real life. However this well-worn paradigm is not the focal point. Instead it is used to illuminate the books concerns with myth and identity. The point is not the journey itself, but the lessons the journeyer takes with them. Instead of grasping for direct answers Ocean leaves us resting on a poignant, quiet note. Maybe by leaving us with so many unanswered questions Gaiman is asking us – How does a child interpret evil? How does a child make sense of a mother who has little interest in him or a father who fails him? I also admire Gaiman because he refuses to sentimentalise childhood. The boy is forced to face the seven-year old terror of no one turning up to his birthday party. He is forced to face up to a mother who has little interest him and a father who not only fails to protect him, but attempts to kill him under the influence of Ursula Monkton. By the end of the novel the protagonist has forgotten, once again his childhood encounter with supernatural powers, he’s forgotten that he once decided to die and was rescued by a friends sacrifice. He’s forgotten the full moon over the duck pond that’s actually the ocean. And yet has he? We get the impression that these memories linger somewhere in his subconscious driving his creativity and the way he chooses to live his life. I was indeed left wondering about the dreaming mind, memory and loss when I turned the final page. Thanks to Neil Gaiman I now look at duck ponds with fresh eyes. Gaiman has stated that he may be more proud of this work than anything else in his prolific career, and it shows. Ocean will captivate you with wonder, terrify you and force you to look for something to make you feel safe again – just like you once did when you were a child. If you wish to know more about Ocean at the End of the Lane I would recommend this amusing video of Neil discussing his work with Google. I would be interested to know what other readers though of the novel!